The Camino de Santiago (the Way of St. James) is a large network of ancient pilgrim routes stretching across Europe and coming together at the tomb of St. James (Santiago in Spanish) in Santiago de Compostela in North-western Spain. The Pilgrimage to Santiago de Compostela reached its peak during the Middle Ages and it is safe to say that it constituted a major cultural aspect of that period of history in Europe. Now-a-days there are different ways to make these pilgrim routes… on foot, horse-back, by bike and even sailing in a yacht. 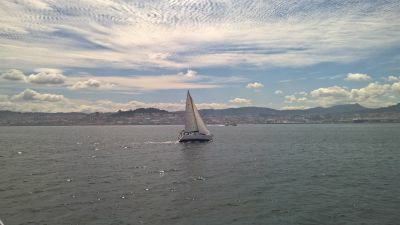 We have rescued the Legend of Saint James by offering a route that combines sailing on a yacht through the Galician Rias Baixas (Low Estuaries), with walking along the traditional Portuguese route to Santiago de Compostela Cathedral. This trip offers tradition, history, trekking, sailing, Galician gastronomy and beautiful old Pazos (Noble Manor Houses) to spend the night. We invite you to explore the sea route, a different way to complete one of the Caminos de Santiago, which covers the history of the pilgrimage as well as the experience of undertaking the spiritual aspects of setting off for the shrine of Saint James. - We are now walking on the Camino Portuguese, and have 11km to walk until we arrive to the Rural Manor House in Carballeira where we will spend the night. - Meals along the way (except pick nick first day), but access to kitchen on the boat and there are good/reasonably priced restaurants along the way.